APC PDUs provide a wide array of power distribution solutions for all data center environments. The standardized APC PDU is designed for increased manageability and efficiency of the server room. Through real-time remote load monitoring of connected equipment, an APC Metered Power Distribution Unit provides warning of potential power overloads before critical data center failures occur. 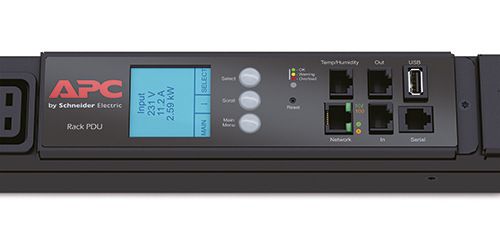 Additionally, an APC Switched PDU with outlet level power control allows for remote power over IP management of power-up and power-down sequencing for individual server rack components. With the increased complexity of IT environments and the growing push for more efficient data centers, APC PDUs provide reliable, manageable, and efficient power distribution at the rack level. Call us today and let one of our engineers help you find the APC PDU solution that fits your IT needs. Wide range of input and output connections. 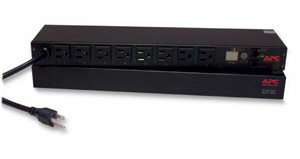 APC Switched Rack Power Distribution Units (PDUs) enable advanced, user-customizable power control and active monitoring. Remote outlet level controls allow power on/off functionality for power cycling to remotely reboot equipment and restrict unauthorized use of individual outlets. Power sequencing time delays allow users to define the order in which to power up or down attached equipment to avoid circuit overload. APC Metered Rack Power Distribution Units (PDUs) provide active metering to enable energy optimization and circuit protection. Mitigate risk with real-time alerts to warn of potential circuit overloads, both locally and remotely. Metered Rack PDUs provide power utilization data to allow Data Center Managers to make informed decisions on load balancing and right sizing IT environments to lower total cost of ownership.